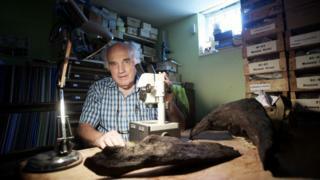 Archaeologists believe they have found a logboat dating back to the New Stone Age in Monmouthshire. Work on a housing development on Wonastow Road, near Monmouth, was halted when the remains were uncovered. The pieces of wood have been radiocarbon-dated to 3210BC and were uncovered on a site which is thought to have once been a lake. The discovery was made three years after a Bronze Age boat building was found at a site one mile (1.6km) away. Archaeologist Steve Clarke said: "As we had just discovered a rich Bronze Age settlement a few fields away we thought the remains would turn out to be Bronze Age. "So it was a real surprise when the dates came back as being twice as old." The five oak timbers have been partially burned, including a piece thought to be part of the boat's stern or bow and another part of the hull.